This Greek orzo salad recipe is easy to make and yet has a very tasty, fresh flavor. It is a great recipe to bring to get togethers or parties, but a wonderful addition to meal at home as well. Grill up or pan sear some chicken and add it to the salad to make it a more hearty, protein-filled meal. This is a recipe that comes from my mom, and I’m not sure where she originally found it. She seeks out tasty recipes. It has always been a passion. You should see her stacks and stacks of Bon Appetit magazines she has dog-eared and collected over the years. I do know this recipe has quickly become a family favorite. I absolutely love the Mediterranean flavors. I did a year long mission trip to England where I was establishing a youth group at a church. During that time, I had the opportunity to travel around Europe a bit. I was able to eat some of those flavors while I was in Greece myself. We love to recreate these flavors in a variety of ways in our own home cooking. It really does feel so fresh and healthy. I hope you find this recipe as great to have in your repertoire as I have. Freshly sliced basil, to taste. Boil pasta according to package direction. Drain. 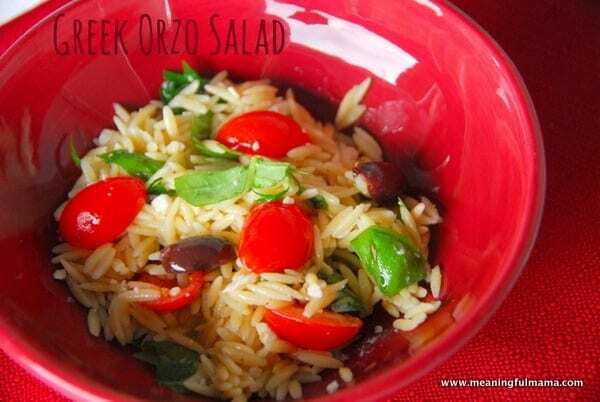 Combine orzo, artichoke hearts, tomatoes, feta, kalamata olives, lemon juice, oregano, fresh parsley. Refrigerate for at least an hour. Add reserved artichoke liquid, and stir to combine just before serving. This salad keeps very well, so if you have leftovers, just serve again another day.